Maui Beach Weddings in the Best Locations! Affordable Maui Weddings coordinates weddings in South Maui. The weather is usually so perfect in this part of the island, that we specialize in this area. Because of years of experience, we know which beach locations are just right for the majority your Maui sunset wedding photography. Our top choices are shown above — the locations that offer features most couples prefer for their beach wedding site: natural beauty, less chance of rain, and low wind. Other beach wedding locations are available that also offer west facing views for memorable Maui sunset wedding photos. White Rock is also known as Palauea Beach Park. This beautiful beach has a long white sandy shore that is recessed so it doesn’t get as windy. South Maui is warmer and drier a average rainfall of 5-20 inches. Each end of the beach is arrayed with majestic black lava rocky points and swaying palm trees. As you stand with your toes in the sand looking over the waves you can see Molokini Crater and Kaho’olawe. The county beach access is on the southern end of the beach, a half acre parcel covered with kiawe trees between road and beach. And like all of Makena beaches looking westward, the sunsets are usually awesome so we are hopeful for that golden hawaiian sunset wedding. Put all this natural beauty plus a Bride and Groom in the picture and you have the makings of magical Maui wedding. PROS: Portable potty, and parking on both sides of the street. CONS: None, White Rock is a favorite Maui beach wedding site. 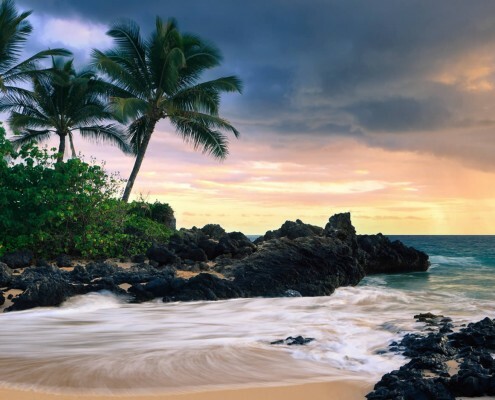 This Maui beach wedding location has a lot to offer: backdrop of kiawe trees to shoot telephoto portraits, and a long sweeping beach to the south. There are lot of different wedding spot choices at this Maui beach. PROS: Portable potty, large parking area, varied attractive photo backdrops. CONS: This location is frequented by many locals, especially for camping out on weekends. Often, fishing poles and lines in the water make photography difficult. There are also a lot of bathers. There are likely to be other weddings taking place at the same time. This location is one of the most popular Maui beach wedding sites. Walking thru a lava rock wall breezeway, you’ll see a small beach with sizable waves at times, but amazing lava rocks lining the shore with palm tree bookends, creating picture perfect photography. An ideal choice for your sunset wedding! Offshore, over the islands of Kahoolawe and Molokini, the typical cloud cover makes for fiery orange sunsets, but seldom produce rain. There is a huge tree to help provide shade as well as flowers gracing the greenery on the rock wall during certain times of the year. At the north end of the beach is a rustic stone stairway leads right into the ocean waters and can be accessed at low tide. PROS: Amazing sunsets! There is a portable potty at this location, just before the lava rock wall where everyone parks long side. If your already on the beach, it’s just a couple minute walk back up the road. CONS: This property is very small and popular so other weddings might be close to you. Tides have wiped out the entry at times taking away the sand and requiring a few steps down over rocks to get into the sand. This may be difficult for elderly or anyone with a physical handicap. At certain times of the year, during high tide, this beach can be completely covered in water. It is a little more private than Po’olenalena because of the distance from parking, but it still has a long curving sandy beach off in the distance. PROS: Chances are good that few others will be on the beach during your ceremony. Palm trees, occasional outcroppings of lava rock on a long beach stretching off in the distance to the north make a scenic backdrop. In some areas, ivy covers on the hillside providing a different, greener look. Located a short walk from Makena Surf resort. CONS: There are no restroom facilities at Makena Surf and the parking is limited. The beach is locked one half hour after sunset, so it is imperative that you finish up and leave quickly once the sun sets. While Wailea Beach was once rated as the world’s number one beach, for Maui beach weddings we don’t recommend it. Close to several hotels, (notably the Grand Wailea), the beach can be quite crowded. Often the noise of a luau in the background can be distracting. We use this beach only if specifically requested. PROS: Located a short walk from hotel accommodations. A grassy knoll overlooking the beach is the best location for a wedding at this site: the slope is gentle as you approach the crest, but drops away on the ocean side offering a dramatic view of palms, the ocean, and the West Maui Mountains. Paved access to the beach goes around the knoll so it is more likely to be secluded at the top than at many other public sites. This site accommodates wheel chairs or anyone physically impaired, giving views of the ocean without being on the sand. Bathrooms with flushing toilets and running water in the sinks. CONS: Crowds and noise. There is only one wedding site on this hill: being a public area, someone else might arrive first and hold onto the location for picnicking or another wedding. 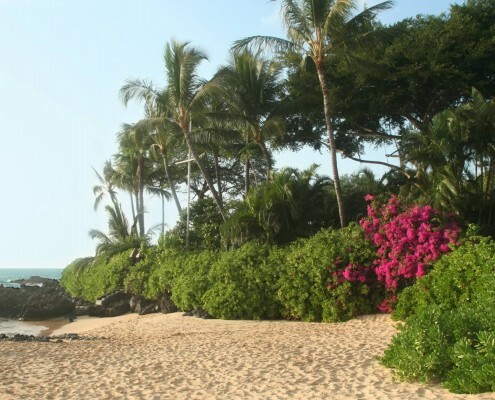 This Maui wedding beach is private and secluded, with parking and a portable potty nearby. The beach is a hidden and out of the way requiring couples to walk over a small lava rock hill to reach it. PROS: Secluded, private location with a very photographic beach. CONS: The beach is not for those who cannot take on a short hike, and then step down from a few lava rocks on the far side. Parking is actually at Po’Olenalena Beach and then you take a short hike to this secluded beach. A nice beach with gently sloping sands to the water’s edge. At the North entrance there is lots of parking and good restroom facilities with a one minute walk to the beach. Looking to the right there is a hung old fallen tree wedged in the lava rocks and weathered white by the sun and the surf n’sea. To the left a big tree providing shade from the hot sun. At the South entrance there is also lots of parking and good restroom facilities with a little bit of a walk down a cobblestone road, to the walk path, down some stairs to the beach. There is an upper grassy area with a big shady tree to cool you off from the sun. PROS: Lots of parking and good restroom facilities with a couple minute walk to the beach. CONS: The beach is narrow and can be crowded and does not have any palm trees in the immediate area. This half-moon shaped bay is a popular swimming and snorkeling site and plays host to many weddings. Two grassy bluffs surround the bay and they form a rather dramatic view on either side of the Bay. Off shore you’ll see the islands of Molokai and Lanai. PROS: A public walkway with grassy areas provides a backdrop for portraits of you to enhance your pictures, but the grassy hills are not supposed to be used for commercial photography. Good bathroom facility with stairs leading down to the beach. Walking distance to Merriman’s restaurant with lots of good parking. CONS: Because this beach is a popular swimming and snorkeling beach, you will see many bathers. Fortunately, their numbers drop off as the sunset approaches, so there will be less people around as twilight approaches. This is a beach that is a lot like Kapalua Bay (and right next to it). Napili Bay is a crescent bay surrounded by vacation condos and is difficult to find unless you know it’s there. The off shore view is of islands Lanai and Molokai. PROS: An excellent ocean front restaurant called The Sea House is located nearby at the Napili Kai condominiums at the north end of the beach. The food is great and both indoor and outdoor seating areas have views is of the bay. It becomes an excellent place to finish off your sunset wedding. Also a good location if you are staying at Napili Bay and don’t want to have to drive to your wedding location. CONS: While the beach by itself is beautiful, we seldom do weddings there because it is so crowded. Expect the beach to have tons of bathers on it. No public restrooms here. Baby beach gets its name from the fact that there are usually only small waves at this little beach, making it a good beach for toddlers. That means it’s likely you will have a lot of families with small children in the background. PROS: Located in Lahaina, this is a good beach for wedding couples who want to get married close to civilization. This is a good beach for couples who want to get married on Maui while they are on a cruise (with the cruise ship in the background). CONS: Not a good choice for couples who want great pictures. Only about ½ mile from the pier. The beach is narrow, so there isn’t much room to navigate. This is a small beach on the north shore right in front of Mama’s Fish House. The sunset here will not be as dramatic due to the north facing orientation, but if you are one of those early risers and want to catch a sunrise without having to drive all the way to Hana, this might be an option for you. PROS: Great for a small wedding party that is planning to have dinner at Mama’s. CONS: No public bathroom facilities and limited parking. Let us help you choose the location for your Maui beach wedding!